The curatorial authorities at the Museo Arqueologico Nacional, Madrid are under increasing pressure to resolve the case of the 22 items acquired for their collection that appear to have been derived from Giacomo Medici and Gianfranco Becchina. 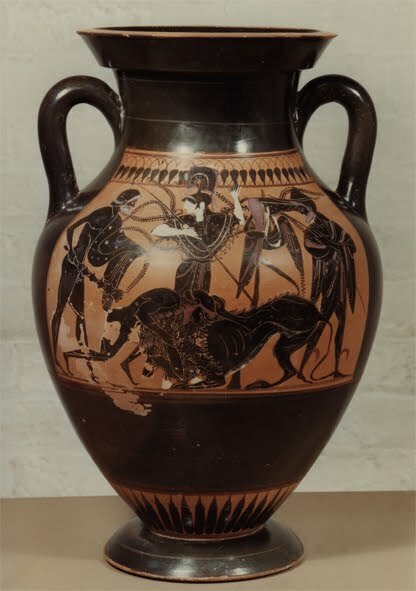 One of the amphorae in dispute first surfaced in the collection of the film producer Joseph E. Levine. The amphora seems to be the one that appears covered with deposits, apparently fresh out of the tomb, in a polaroid from the Medici Dossier. So how did the amphora move from Medici to Levine? There is a far more fundamental question that Madrid needs to answer. How was the museum able to acquire a major collection antiquities of recently-surfaced antiquities in 1999 without ensuring their collecting histories? Remember that this was in the period after the revelations of the Geneva Freeport Raids and the dispersal of antiquities through a certain auction-house through the London (and was it only London?) market.